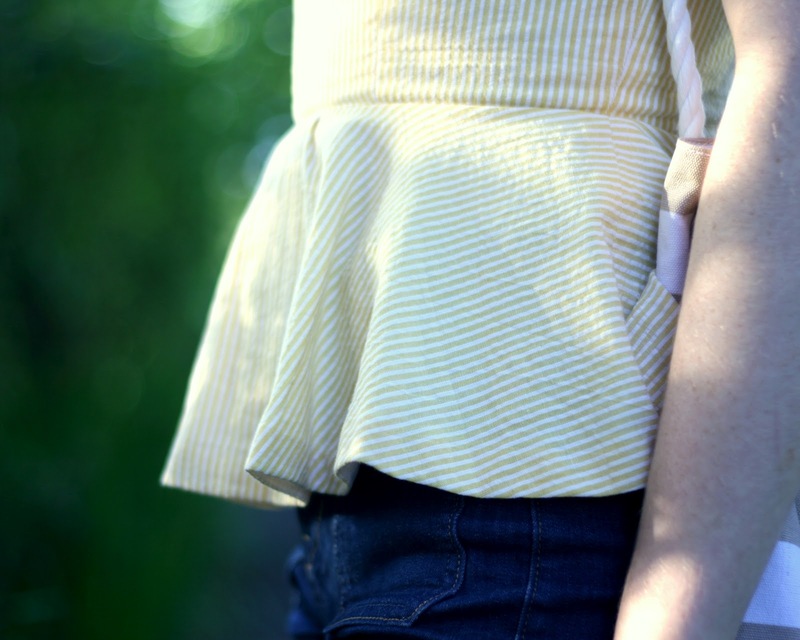 How to Wear DIY: This peplum tank is like my new favorite shirt. Plus, double DIY! I've been looooving this peplum tank I made, modifying a dress pattern and adding the circle skirt. I love how it has the sweet, sort of old-fashioned look of a dress, but I can wear it with jeans or shorts and be cute and casual. Wore it to husband's and my date night over the weekend with some other new (this year) fave Old Navy shorts--sort of high-waisted and not too short!--and, of course, my DIY mint wedges. Also love those! So, here's a (double DIY!) How to Wear DIY for you! And, to keep with the preppy, pastel theme, my new white/tan striped Old Navy tote. Oh, and my husband approved of the outfit. I think his exact words were, "I like that shirt because it's like a little dress." Men + descriptive words about clothing does NOT equal much. ;) But I appreciated the compliment nonetheless! Bag and shorts: Old Navy. Necklace: Nordstrom Rack. Shoes: DIY, mint-dyed wedges! Anyone else been enjoying a structured, woven top like a peplum tank? I think Anthropologie inspired us all with their cute knit ones, but I'm seriously up for making another something similar. I love how pulled-together I can feel with just a top and jeans! (Perfect for summer when you don't want layers anyway!) Anyone made or worn anything similar? OK, now I need to make one. LOVE it - I have a love affair with seersucker. Great job! Haha, thanks! I loooove cotton seersucker too! I love the shoes!!! Great color!!!!! I love that. Do you have a tutorial for making a circle skirt? I have that simplicity pattern and would love to make this top. This looks great and I have to compliment your photography/ modeling again :). I've been rocking the wedges as well! I made a peplum tank using the simplicity 4070 pattern and modifying it a bit. I love it, except I don't think the peplum trend has quite hit here in Australia yet. Lovely style though! Very cool! You can be a trend-setter, anyway! The shirt looks great, I'm so inspired! I have some fabric that would be perfect to make a similar style. Your whole outfit is so simple and perfect for summer.